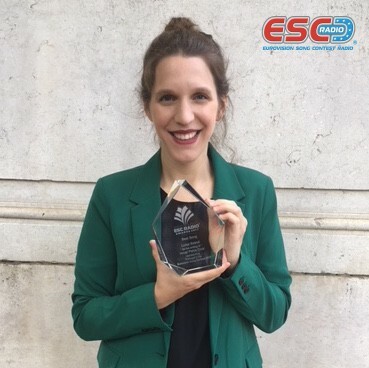 Luísa Sobral, winner of the 2017 ESC Radio ‘Best Song’ Award, has sent us this picture, showing her with the trophy. Luísa composed Amar pelos dois, which won the Eurovision Song Contest 2017, performed by her brother Salvador Sobral. It was Portugal’s first win in the contest since the country’s debut in 1964. Luísa recently gave birth to her second child. Her daughter Rosa was born on 13 May, two months ago today. ESC Radio wishes Luísa and her newborn many years of good health, love, and happiness with the whole family! This entry was posted on Friday, July 13th, 2018 at 4:30 pm	and is filed under News. You can follow any responses to this entry through the RSS 2.0 feed. Both comments and pings are currently closed.